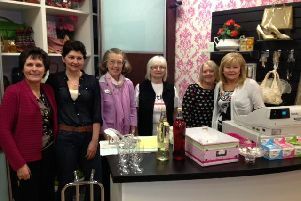 The Thai it up cookery class was very popular last week at Carrickfergus Cookery School, Carrick YMCA. The evening class enjoyed making these Thai fish cakes with homemade Thai sweet chilli sauce, and are great as an impressive starter! Visit www.carrickymca.org for more ‘Scratch’ cookery classes or to book a slot at our new ‘Cook your own’ lunch classes. 1. Place the fish fillets in a food blender and blitz into a smooth paste. Add all the remaining ingredients except for the sunflower oil and mix well. 2. Weigh the mix into 80g portions and then roll each portion into a ball. 3. Place each ball on a board and flatten gently with the palm of your hand, so each ball is turned into a burger-shaped patty. 4. Heat the sunflower oil in a heavy based frying pan and fry the fishcakes for 5 minutes on each side. Transfer the cakes to a preheated oven set to 165°C/gas mark 3 and cook for a further five minutes. Serve with Thai sweet chilli dip. 5. For the dip, mix 25ml cold water with a pinch of cornflour together to dilute the cornflour. Place 85ml of white wine vinegar, 175g of caster sugar, 12g of fish sauce, 1-2 red chillies, finely chopped, 1/2 garlic clove, 1 tsp of fresh ginger, finely chopped, 1 pinch of salt, all into a saucepan and bring to the boil. Once boiling, whisk in the water and cornflour solution and boil for another 1-2 minutes.